The Galapagos Islands are a unique world, rising up from the sea from erupting volcanoes. Experiencing the islands is a once-in-a-lifetime adventure. Most people call the journey the greatest bucket list experience of their lives. Simply landing on the beautiful islands is one thing but getting to know their heart and history is quite another adventure altogether. Celebrity Cruises allow you to immerse yourself in centuries-old landscapes, catch rare bird sightings, hang out with giant 100-year-old tortoises, and snorkel with endemic marine life, making the entire trip one big bucket list adventure. 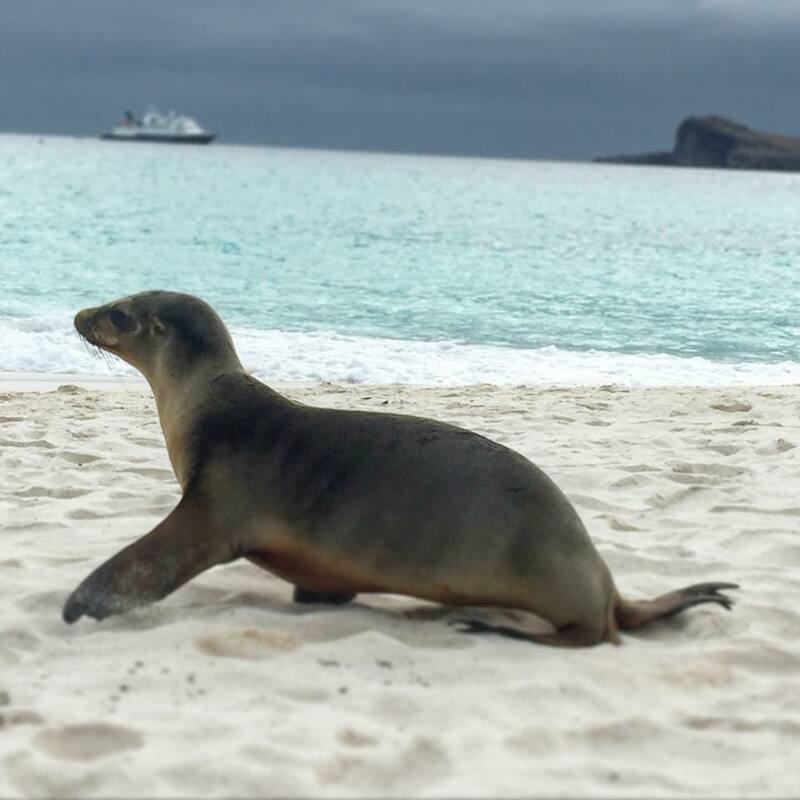 While every minute with Celebrity in the Galapagos was magical, these were my top five Galapagos bucket list moments on Celebrity’s Xpedition. These iconic birds are plentiful throughout the islands, and watching the male blue-footed booby dancing with his tail up, wings spreads, and whistling toward the sky was a colorful moment that I won’t soon forget. Nor will I forget watching a majestic booby plunge through the sky to feed on fish that swam at the water’s surface. Equally beautiful, just watching a blue-footed booby standing on the stark-contrasted black lava rocks. The Galapagos Islands population includes about half of all breeding pairs of blue-footed boobies, making them high on our Galapagos bucket list. Seeing their blue feet with your own eyes is a surreal moment. The more colorful they are, the more attractive they are to mates and the more unreal they seemed to me. Curious and enchanting, the sea lions of the Galapagos Islands gather in colonies on the sand and rocks. 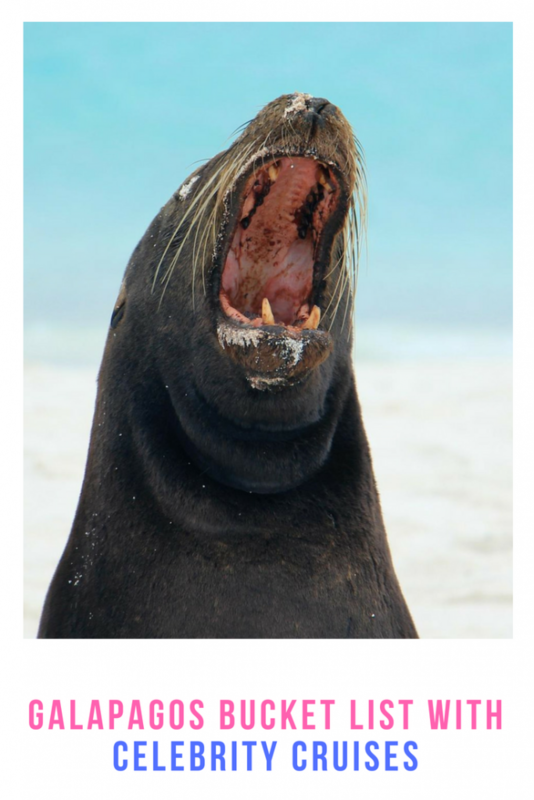 Sea lions feed during the day and spend hours sleeping on beaches or body-surfing in waves. Seeing them on land is lovely but the true Galapagos bucket list magic happens when you snorkel with them in the water. They are playful and not at all nervous of people. 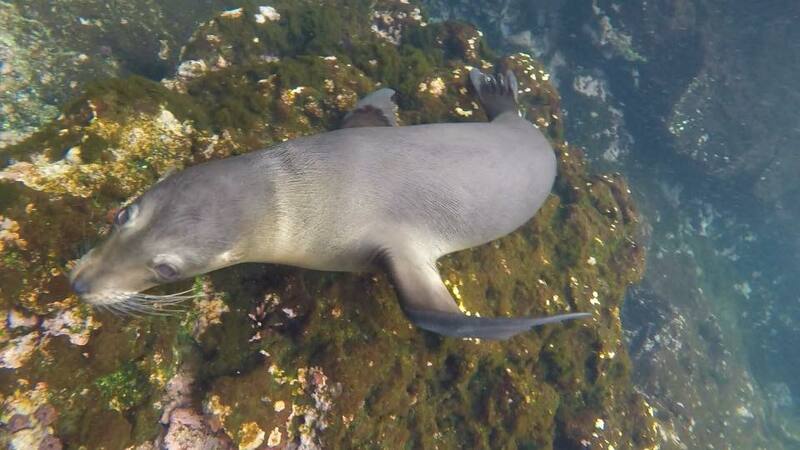 Our first water experience with sea lions was around Champion Island during an advanced, deep-water snorkel. Three pups dove into the water anxious to play with their new friends – us. One pup mimicked my behavior, turning and spinning in the water following my every move. They weren’t aggressive or fearful. They had no reason to be. They are so well protected in the Galapagos that humans aren’t seen as a threat. We’re playmates and they are not about to follow the distance rules set for us. 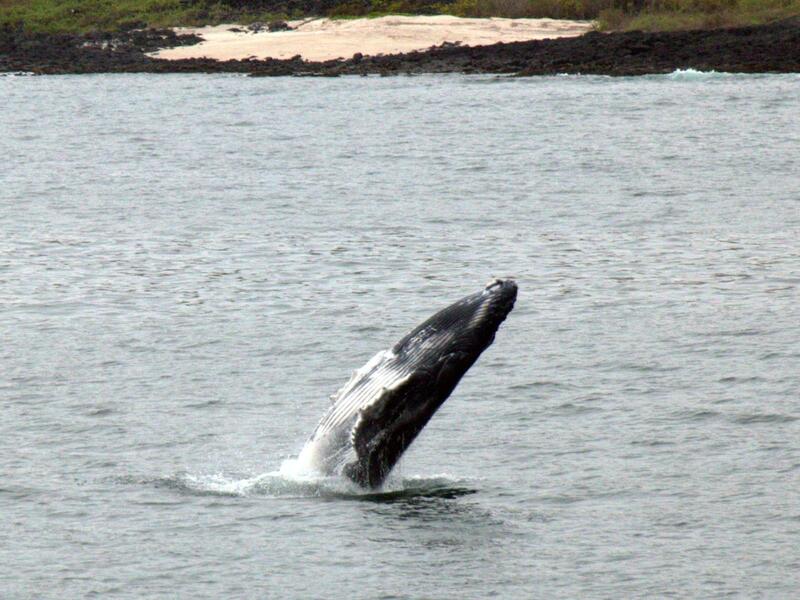 There are plenty of places to see whales in the world but in true Galapagos bucket list style, we had a magical whale moment after returning from one of our shore excursions. A mother and calf were swimming by the Xpedition when they both started to breach. For at least twenty minutes, the calf and the mother took turns breaching out of the water in a magical display of showmanship. They must have spun and splashed high above the water about fifteen times. It was like witnessing a wild Cirque du Soleil performance put on for our entertainment. Most babies make me smile. 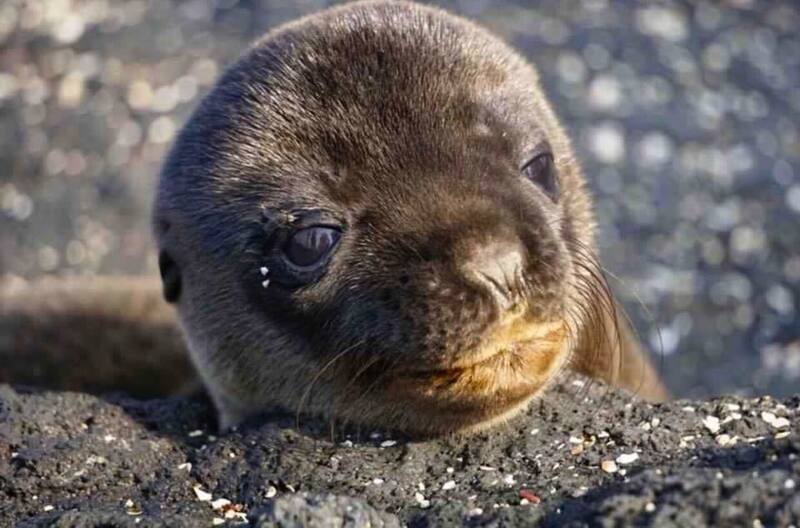 Seeing new life is wondrous, especially when it’s as cute as this sea lion pup. New life was around every corner on the Galapagos Islands. From turtles to iguanas and sea lion pups to blue-footed booby chicks, there were babies everywhere. The miracle of life was all around us. It wasn’t even just animal life, but the rebirth of islands from lava rock to grass and trees that left me appreciating how precious life truly is. My greatest Galapagos bucket list dream was to see Galapagos penguins. On land, Galapagos penguins move like a comedy routine, complete with hilarious slipping, sliding, and wobbling. In the ocean, penguins swim gracefully with their front fins, steering with their feet. 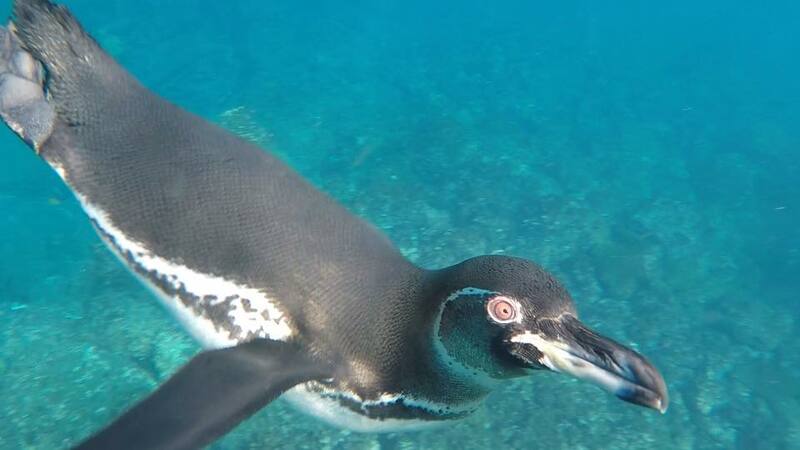 Never, in a million years, did I think I would get to swim with penguins but it happened during my snorkeling experience at Punta Vicente Roca. A group of penguins swam by and they were just as curious as the sea lions. A new friend of mine, Mike, captured this cutie posing for the camera as he gracefully swam by. 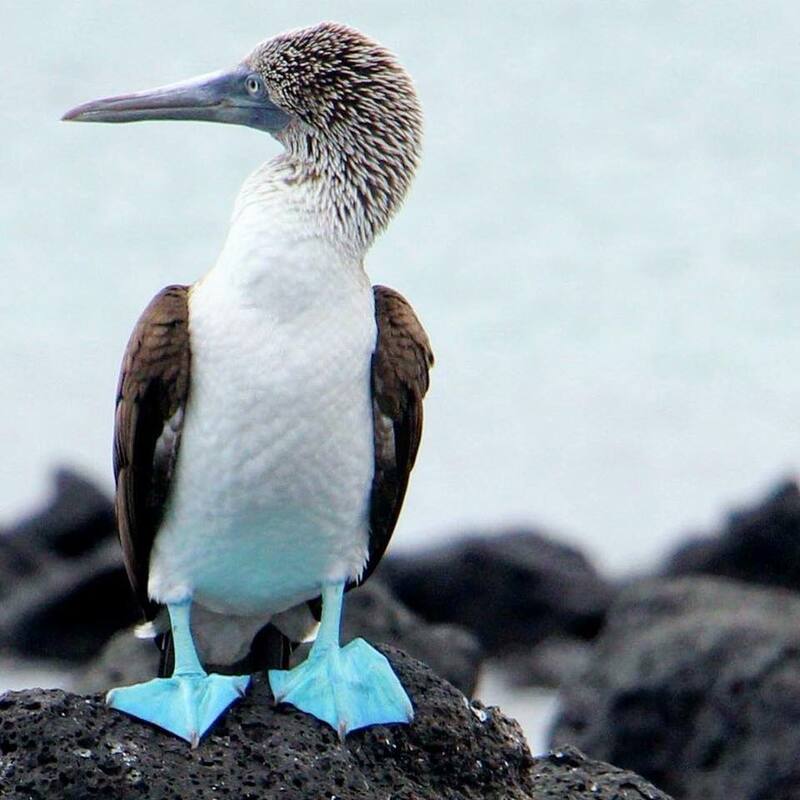 The possibilities for your Galapagos bucket list are endless. You could spend years thinking about what to include and you’d never cover it all because you have to be on the islands to fully understand their uniqueness and the options. I focused on the wild side of the Galapagos but there is so much more to discover. Gentle giants, dragons, and ocean ballerinas are just a few that didn’t make the top five list but still remain remarkably close to the top of the list. I couldn’t pass up a chance to say, “I love boobies” or forget about the adorable penguins. What wild items top your Galapagos bucket list?